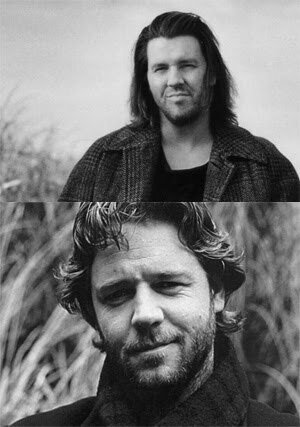 David Foster Wallace → Russell Crowe? Because of the way human beings relate to narrative, we tend to identify with those characters we find appealing.... When everybody we seek to identify with for six hours a day [of TV watching] is pretty, it naturally becomes more important to us to be pretty, to be viewed as pretty. Because prettiness becomes a priority for us, the pretty people on TV become all the more attractive, a cycle which is obviously great for TV. But it’s less great for us civilians, who tend to own mirrors, and who also tend not to be anywhere near as pretty as the TV-images we want to identify with.... This very personal anxiety about our prettiness has become a national phenomenon with national consequences.... The boom in diet aids, health and fitness clubs, neighborhood tanning parlors, cosmetic surgery, anorexia, bulimia, steroid-use among boys, girls throwing acid at each other because one girl’s hair looks more like Farrah Fawcett’s than another ... are these supposed to be unrelated to each other? to the apotheosis of prettiness in a televisual culture? One wonders how the transhumanist is to contend with such a problem. The libertarian transhumanist, especially, admits into his moral vocabulary little beyond the individual will. It is the locus of all human action; any collective action is only properly constituted contractually. What then of the influence of popular culture — whether in average people’s everyday anxiety over the gulf between their looks and the looks of the pretty people they almost could be but are not, or in their actual efforts to bridge that gulf? The libertarian can deny such anxiety by proudly affirming that the individual will exercises itself autonomously, but as Wallace indicates, this is a woefully inadequate account of the way people think and make choices about their appearances (see: Nadya Suleman/Angelina Jolie). The only other option is to affirm the supreme rights of the individual will in exercising its personal choices of expression, irrespective of whether those choices are truly autonomous. Every person can and should make himself — including his body — into whatever he freely chooses to be. This is the mantra behind morphological freedom. The numbers of people who go to drastic measures, starving themselves, going under the knife, etc., are surely then by virtue of their expressiveness the freest of all, and cosmetic technology a force for their liberation. Jocelyn Wildenstein is to be heralded as the Frederick Douglass of the morphological emancipators. Because the libertarian transhumanist view admits of no normativity, neither can it admit of pathology. Libertarian transhumanists must claim to celebrate all morphological choices equally. In practice, of course, they do not celebrate them equally, for their ideology has its own qualitative distinction in the virtue of choice: It favors those “expressions” that seem to be freer — that is, those that have departed more from the given. Libertarian transhumanists seem vaguely aware of and mostly fine with this internal contradiction. But there is a deep irony in the fact that their embrace of morphological autonomy as liberation from cultural conformity commits them to celebrating choices that are so transparently made by unhealthy wills succumbing to the grip of cultural norms. "Another problem with our oversized world is the illusion of increased competition. There's that famous survey which showed that Harvard students would rather make $50,000 if their peers were making $25,000 than make $100,000 if their peers were receiving $200,000 - and worse, they weren't necessarily wrong about what would make them happy. With a fixed income, you're unhappier at the low end of a high-class neighborhood than the high end of a middle-class neighborhood. If the bioconservative critiques of transhumanism ever catch up with the transhumanist-internal threat analyses, I'll be sure to let you all know, but the transhumanists are way ahead on this one. Not sure what that whole business about "libertarianism" was. Transhumanists are generally pretty clear on the fact that the human brain is a flawed design with known, exploitable bugs, rather than a perfect reservoir of free will. Mr. Yudkowsky, your usual strategy of declaring victory and getting the hell out is rather tired. The first link is in fact only barely relevant, while the second construes the problem very narrowly as a question of market economics versus government regulation, continuing the incomprehension my post describes of the pressing moral, cultural, and political issues at hand, and not even offering any answer in the meager terms in which it is presented. This is pretty amusing, actually. Ari Schulman writes a post gently challenging, on multiple grounds, the notion of autonomy that underlies the libertarian-transhumanist philosophy. 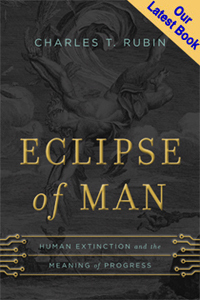 Mr. Yudkowsky writes a comment suggesting that Mr. Schulman is ignoring the existing transhumanist literature on this subject — and provides as examples two obscure posts from his own website that are barely related to the subject at hand, followed by comments that make clear he didn’t understand what Mr. Schulman wrote. The price of freedom is that some people will make bad choices. So what? I think this is a red herring argument. Who said freedom was free? Of course there is cost in freedom. However, this is a very small price to pay for freedom and I'm willing to pay it. Kurt, the point is not that people are making bad choices, but rather that these choices seem plainly shackled by culture — that is, these choices are in fact not free to anything near the degree we tend to think. The language that admits of nothing but the individual when describing freedom, then, tends to be unable to comprehend many ways in which individual freedom is impinged upon.